Whew! I’ve been busy in the kitchen. But, today (day 24) I got the evening off. 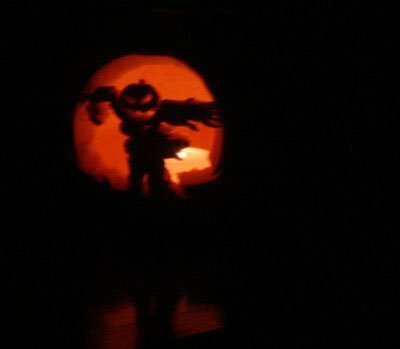 We went to a pumpkin carving party. 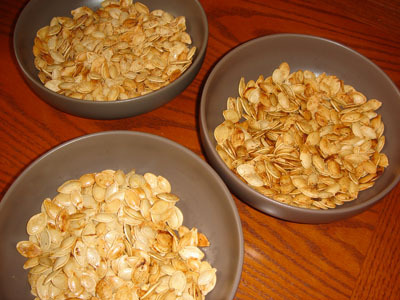 I was busy making pumpkin seeds so I never actually got to carve a pumpkin. 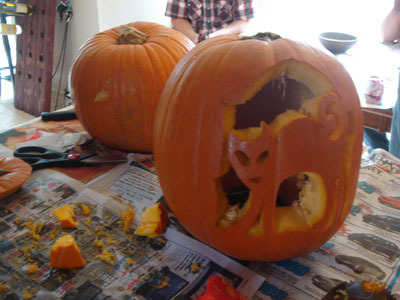 That’s ok, maybe Dan and I will carve them later in the month. They served tacos with all the fixins’… fabulous guacamole, roasted veggies, grilled portabello, shredded lettuce, corn tortillas, chopped white onion, cilantro… everything a girl needs on her tacos. Yummy stuff! And, I’ve been on this hard cider and lambic kick lately. I guess with the change of the season I wanted a change of beverage. Those apple ciders, cherry lambics, and apple lambics are so tasty, almost like eating a fresh fruit.I’d highly recommend trying them if you haven’t tried before. And, if you tried them before, go to BevMo and get a couple more to savor this weekend- the fall weather is the perfect time.